Nasturtium (Tropaeolum spp.) is an old-fashioned flower that has stood the test of time and is still commonly planted for its bright orange blooms and lush round leaves. It's ease of growing and tendency to reseed has cemented its well-deserved place in the hearts of gardeners. Nasturtium grows as a five to six foot vine that is can be allowed to ramble across the ground or be trained up a trellis. However, there are dwarf varieties available that grow as compact plants just eight to 10 inches tall and wide. Nasturtium tolerates full sun in cool climates though it grows well in partial shade to nearly full shade, which it appreciates in hot places. The foliage has a very lush texture and a round shape that can range from one inch in diameter to four inches across. Shade reduces the number of blossoms, but increases the leaf size. Nasturtium flowers are typically bright orange, but come in an array of other warm colors, including yellow, red and cream. The flowers are about one inch across and are edible - they have a spicy flavor and are often used to garnish salads. 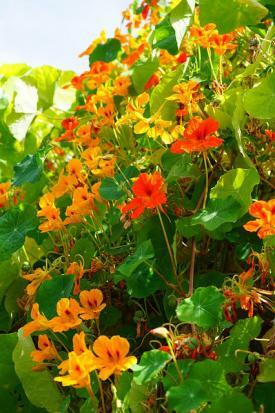 Dwarf nasturtiums are used as an annual bedding plant or in potted arrangements, especially hanging baskets. The larger, vine-like varieties have rustic charm when planted to cascade over an old fence or garden wall, or used informally in cottage gardens as a species that will meander along the ground and soften the base of taller perennials. They make a great guise to hide the fading foliage of spring-blooming bulbs and are occasionally used as an informal groundcover in orchards or under small ornamental trees. However, the drawback of nasturtium as a groundcover is that it dies back with the first hard freeze in winter and tends to look shabby in the heat of summer. Nasturtium is at its best in the cool weather of fall and spring. 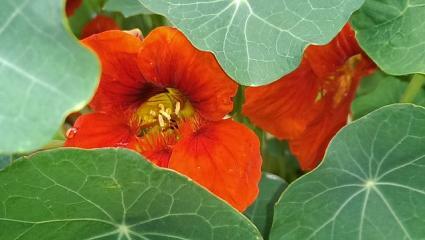 Nasturtium is tolerant of both sun and shade though partial sun with afternoon shade is usually best. It is modestly drought tolerant when planted in the shade but it will shrivel up if it goes without water for more than a couple of weeks. With regular irrigation it stays lush and full of flowers. Nasturtium isn't picky about soil type, but it prefers a bed of loose garden soil enriched with compost. 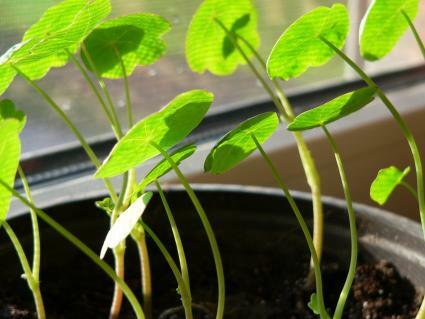 Nasturtium is one of the easiest plants to grow from seed. Simply plant it a half inch deep in loose garden soil and keep it moist - it should sprout within a week. The dwarf varieties are often available in six-packs and can be planted at an eight-inch spacing. Nasturtium can also be started indoors in a sunny window in late winter. Transplant the seedlings as soon as the ground can be worked in spring for an early season bloom. There's not much maintenance with nasturtium. Just water it periodically and remove the leaves as they fade. When the entire plant starts to fade at the end of the growing season, or if they start looking bedraggled in the heat of summer, simply pull them up by the roots and place in the compost pile. Nasturtium will usually seed itself in the same place year after year. There is little in the way of pests or disease that bother nasturtium plants though aphids sometimes seek out the succulent foliage. If this occurs, a strong blast of water from the hose or an insecticidal soap will usually dispatch them. Severely infected plants can simply be removed. 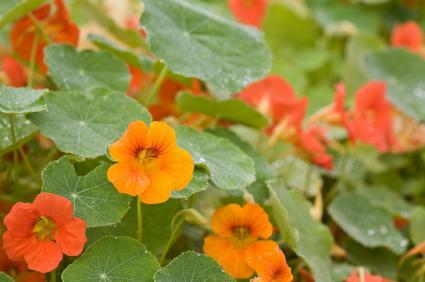 Nasturtiums are selected for their size, flower color, and occasionally, leaf color. 'Peach Melba' is a dwarf variety bearing double yellow flowers with a reddish-orange center. 'Moonlight' grows to six feet and bears pale yellow blossoms. 'Empress of India' has crimson-colored blooms and grows about four feet long. 'Alaska' is a dwarf variety known for its variegated foliage and a mix of yellow, cream and deep red blossoms. There is nothing especially exotic about nasturtiums; they are just one of those simple, old-fashioned flowers that are hard not to love. 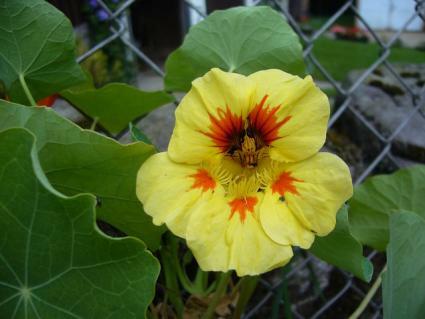 An investment of a few dollars in a packet of seed will bring about a lifetime of nasturtium joy.